Thank you so much to everyone for the most wonderful comments about my Pockets Full of Posies quilt!! It's amazing to get such encouraging and positive feedback. Pockets Full of Posies was the most popular name but I'll include Denim Garden on the label as well. I received this gorgeous card from a good friend. 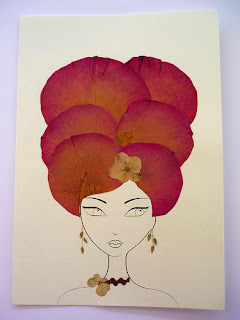 What a clever use of dried flowers. How pretty are the dainty earrings. From dried petals to the real thing - These are my favourite flowers of all time. 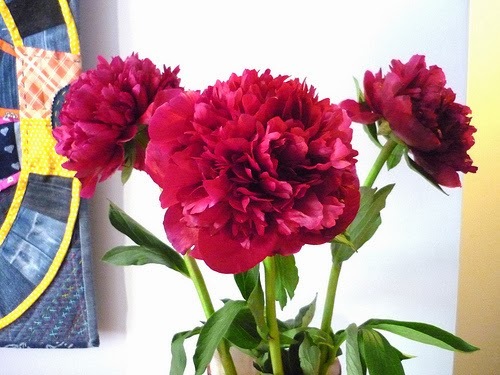 Dark Red Peonies. I'm lucky that they usually flower around my birthday so I can get a bunch to celebrate. ... and blossom into these big fluffy blooms. 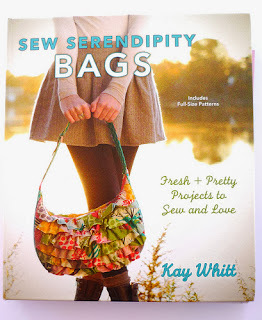 I was the lucky winner of Sew Serendipity Bags as giveaway prize at Forget-Me-Not blog. Do you think the Universe is telling me I should make a bag? The ruffle one on the cover is particularly tempting. Here's some recent fabrics added to my stash. It's hard to resist colourful text prints and blue daisies. This next fabric has to be the best cheater fabric ever. Crochet Granny Squares fabric!! I found it at Spotlight. 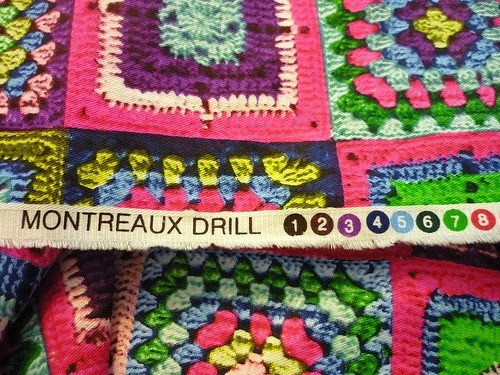 It's a drill cotton so heavier than quilting cotton. I was thinking it would make a fun skirt, quirky cushions or even a bag from the Sew Serendipity Bag book. I'm smiling. Your story is familiar. I'm sure all quilters have hidden treasures. I sure do. Let us know which one you work on next. I have to get some of that granny squares fabric! Oh, eleven UFOs! !Good luck making a decision which one to tackle first! Love that crochet fabric- what a great idea! What will you make??? I've got lots of UFOs too. I keep getting swept up with new ideas and abandon current projects. 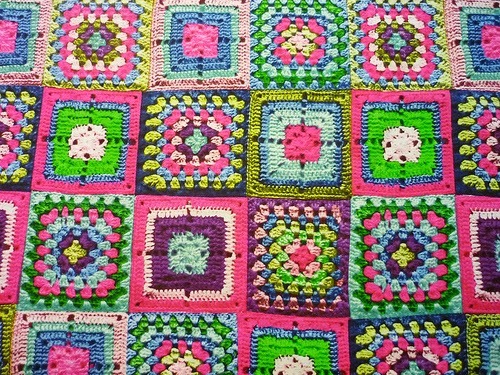 Love your granny squares fabric. those granny squares are awesome! Amazing what Spotlight turns up sometimes! The flowers are very beautiful!Loke the vase as well! Are you going to frame your card? I think you put so much love into that quilt that you need a little break to regroup. I love peonies too, that color is gorgeous. UFO's will always be a part of our lives, I am learning to live with them!!! I need to get some of that text fabric, very cool. That cheater granny square fabric is just too amazing!! I've never seen anything like it! UFOs are a fact of life. Finish one and and another one pops up. Sort of like laundry. I am pleased to say I only have four or so quilt tops awaiting being made into quilts, including my first ever quilt top that has been waiting what four years now! Love the cheater cloth - haven't seen that one at Joann's. Scroatfight's plain quilting fabric is pretty good quality too, or it was just before I left two years ago - I reckon it's better than Kona cottons! It has a lovely hand. Wow, I love that granny square fabric! I'm sure you'll come up with a great plan for it. I also really love that ruffled bag too. Frankly, a backlog of 6 finished tops is better than my backlog, because mine haven't even made it to the finished flimsy point yet! Lovely art card – some people think of the most creative things! 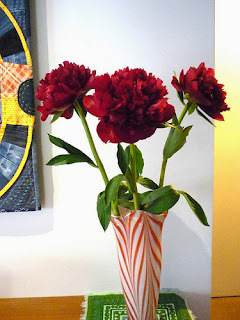 I love the vase those peonies are sitting in ...very unusual – and completely you! That crochet fabric is amazing...I wonder if I could fool Marg into thinking Ive actually learned to crochet with it? Poor girl tried to teach me once and nearly ripped all her hair out in frustration. Ive been cleaning out my sewing room for three weeks now- still not finished and at the moment Im not sure it looks any better than when I started. Good luck with yours! You make me feel better, I don't have quite so many UFO's, thank you. 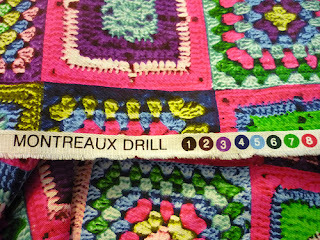 I'm going to have to make that 45km trip to Spotlight to check out the fabric, I love that granny square one. I'm sure you'll have plenty to do over the holiday break with all those ufos. Love the granny square fabric too! lovely flowers and the vase is equally as beautiful! That cheater fabric is amazing. I had to look very carefully...it looks just like crochet granny squares! I think we all get a big fright when we look at our UFO list!! 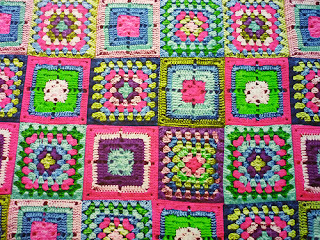 I do like that granny square fabric. Will have to look out for that one. Love your peonies! I had some light pink ones a couple of weeks back.I love fresh flowers. Maybe you need to wait for one of those unfinished projects calls you. That crochet fabric looks awesome and you should definitely make a bag. I would love to see your take on it. Yes Rachael we never know what lurks around till we have a clean up LOL! Your name is perfect for your quilt...good thinking there! Congratulations on your bag...you will make that a fun one I'm sure! Oh golly gosh those peonies...I have carted one around with me for 10 years as it was love at first sight for me when I saw them! It is doing really well in the pot now and I am too scared to re-pot it! They are just beautiful! 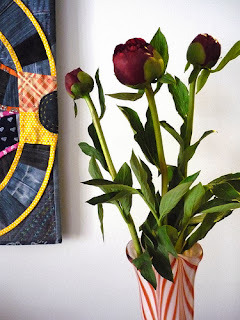 That fabric is just gorgeous and so 'Rachael'! Best wishes on finishing your UFOs and WIP! They sometimes stack up, don't they? What lovely flowers with a wonderful color. I can see why you love them so much. Wow, I love that fabric with the granny squares on it - must rush to spotlight and get some - I'm thinking Bag! 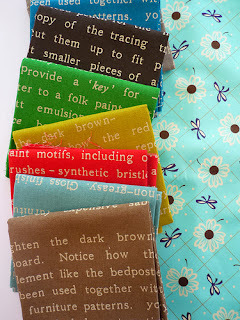 Love the text fabrics with the Blue Daisies;) Lol... Just catching up with some blog reading now.